Want to know how many words you added to (or deleted from) your manuscript today? Need to see how close you are to your total word count goal? 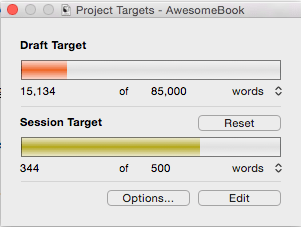 My favorite way to do this in Scrivener is via Project Targets. The Project Targets feature lets you set an overall project target (of words, characters, or pages [Mac only]), as well as a target for your writing sessions. You can also set a target for an individual document within your project. This is great if you're shooting for a minimum word count for a scene, or when you have a desired word count for a blog post or article. See the Document Targets section at the end for more. To open the Project Targets window, go to Project—>Show Project Targets (Mac) or Project—>Project Targets (Windows). You'll see two types of targets: Draft (or Manuscript or something else depending on which template you chose or if you've renamed that folder) and Session. Lets you set a goal for the entire manuscript. Only counts text from items stored within the Draft folder. By default, it only counts text from items that are selected to be included in Compile, either in the Inspector's General (General Meta-Data in Windows) section, or in the Contents pane of the Compile window. Windows users can deselect the “Documents included in compile only” checkbox to count all text in the Draft folder. Mac users can make the change under the Options button (see the Project Target Options section below). Lets you set a goal for your current writing session, whether it be one hour, or the whole day. Provides a net word count, so if you delete more words than you add, you'll get a negative result. This might be desirable, especially if you're trying to reduce your total word count during revisions (Mac users can change this behavior in the Options section). Count resets at midnight or when you close the project (Mac users can change this behavior in the Options section) . Under the Draft Target progress bar, click in the number box after the word “of” to enter a target for the entire manuscript. To change from words to characters or pages (Mac only), click the double arrow button and select your preference. 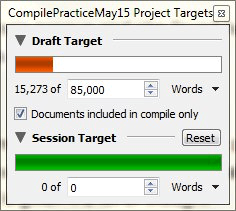 Follow the same steps to set a session target in the text box below the Session Target progress bar. The progress bar fills and changes color (in graduated shades from red to green) as you add words. You can change which documents count toward your progress and how you’re notified by clicking on the Options button while in the Project Target window. Applies to your entire manuscript. – The first option will only count words written in documents that are set to be included in compile (either in the Inspector's General section [called General Meta-Data in Windows], or in the Contents pane of the Compile window). – The second option will only count documents selected to compile in your Compile Manuscript settings (chosen in the Contents pane of the Compile window during your last compile). This means that even if a document is selected for compile, if you've applied a filter or some other means to narrow down what gets compiled, this box will only include the final (smaller) list. – The Deadline option allows you to input the date that you need to reach your goal. These options apply only to the current writing session. – The reset drop-down menu lets you choose if/when Scrivener will reset your session count. If you tend to work late, or don't take note of your progress until the next day, I recommend choosing to Never Automatically Reset Session Counts. – The first checkbox in this section lets you count words written anywhere in the project, even outside of your Draft folder, even those not checked to Include in Compile. That means character sheets, notes, etc… But this only applies to the Session count, not the progress toward the Draft goal. – Allow negatives lets you have a net word count below zero. So, if you write 100 words and delete 200 words, your session word count would be −100. If you uncheck the box, your word count won't dip below zero no matter what, but your net count may be inaccurate if you delete a lot of text. – Automatically calculate from draft deadline lets you choose a deadline and let Scrivener determine how much you need to write each day to meet it. For this to work, you must have a date entered in the Deadline field of the Draft Target section above. – Use the day of the week buttons to select those days that you intend to work. 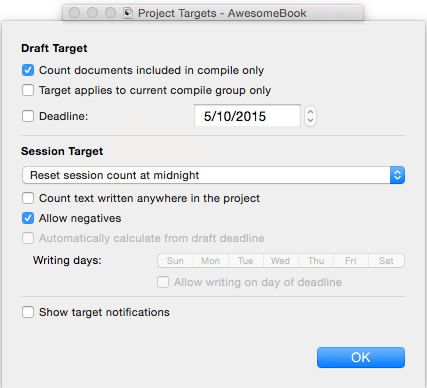 Scrivener will adjust the target session count accordingly. If you select this option, a small pop-up will appear when you reach your target (or fall back below it when deleting text). In addition to project and session targets, Scrivener also lets you set targets for each specific document and displays your progress in the status bar at the bottom of the Editor. To start, select the document for which you want to set a target. 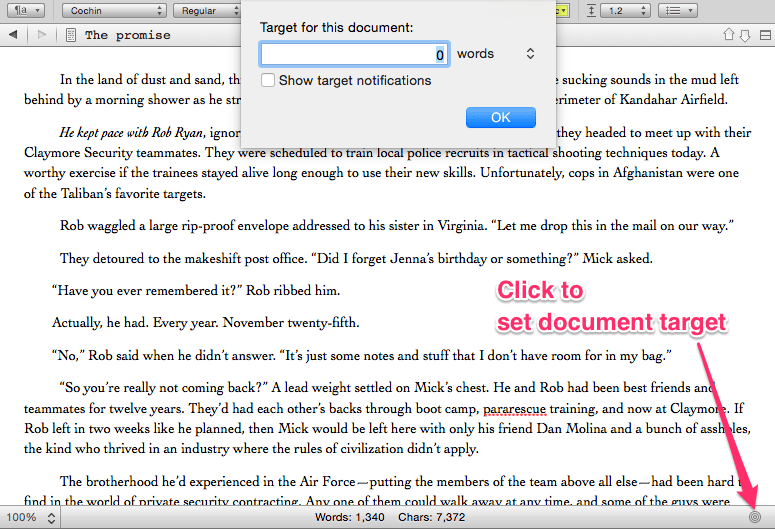 Click the circular target icon at the right of the status bar at the bottom of the document (see image). Enter the target count and select the type of target (words or characters). If desired, choose to use notifications. The word count/target and a colored progress bar are now visible in the status bar. Enjoy shooting for those targets. May you have many words to track! For more on targets, check out this 6/30/2016 post on Tracking Progress at Writer Unboxed. As always, your posts are supremely helpful. Even features that I’ve been using, you find an ‘extra’ feature that I had completely overlooked. Thank you! Thanks, Ara! Glad it helped. Thanks for the article but perhaps you should have edited this piece before release. In your second sentence you say, “to your total word count coal” but I guess you meant “goal”. I just want to tell you that I am thinking of you since yesterday, reading your tweets and what is happening back home (even with the snow mess) is making me terribly homesick! I want to let you know also that I am reading your blog, and I love your stories, but haven’t been active writing comments because I read your blog from my tiny iPod and it is difficult to leave a comment and to log on to Wrod.press. I hope everythign is well with you, here things are fine …. but I am extremely busy. Thanks for letting me know, Mirella. We’re all home safe and the snow is beautiful. I’m glad you’re keeping busy, I think it will make your time there easier to handle. You’re involved in history! 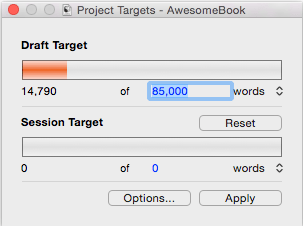 I can’t figure out why Scrivener grays out the option to have Growl notify me of my goal progress. I own Growl, but Scrivener blocks this option. Any advice? I’m not sure, Devin. In my experience, if you have Growl installed, the option will be available. I know there’s a new version for Lion, so maybe that’s an issue. If you can’t figure it out, you might try the Scrivener forum (http://literatureandlatte.com/forum/). Good luck! This is great, but I was hoping you’d help me with Outliner, the Project Targets and colours show up in the Targets Box but they don’t show up at all in outliner view, where both Progress and Target appear as zero, on each document even though they should all be contributing to my set Manuscript target. 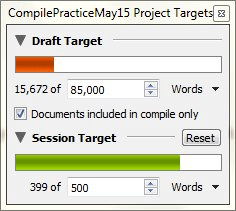 I read somewhere that you have to set a target per document, but I don’t have a target per page so much as an end goal. I’ve looked and I’m not sure what it is I’m not doing here. Roz: The project targets box doesn’t have a way of attributing a portion of the target word count evenly among your documents. The targets and progress you see in Outliner are for document targets, and as you’ve discovered, will only work if you set them at the document level. Even if you don’t have an scene target, if you know you have 80 scenes and want around 80K for your MS, you could set each one to 1000 just to give you a push. You might try making a suggestion in the Scrivener forum if this is really important to you. http://literatureandlatte.com/forum/ Try the Wish List forum. Hi Gwen, Thanks for your writing & tech tips. They are most useful. I’m using project targets. Under session targets I de-select “Count text written anywhere in the project.” It still counts anything I type (or paste) in my Draft (folder), even when the section is not included for compile. However, it does not count what I type in my Research (folder) which is for non text items in the first place. Is everything written in the Draft (folder) included by default regardless of the session settings? What might I be overlooking? Thanks for your time on this one. Sinead: Yes. As far as I know the Session Target counts all text written in the Draft, even if the document is not checked to Include in Compile. I’m still learning Scrivener and I’m so glad you have this information out there. As a PC user, the rules are sometimes different and it’s not always easy to find the “easy answers.” Still, you have them in a clear, accessible format. Glad it was helpful, Mary! I wrote most of these back when I only had the Mac version and hadn’t written the book yet. In new posts or those that I later update, I try to include Windows instructions where different. Thanks! More Scrivener tips wholesome goodness. Emily: So glad the post helped. Thanks for letting me know, and good luck! Hello! Great Post! A question and an answer if possible. I use the Strikethrough functionality during revision process of my manuscripts. Is there a way to exclude the Strikethrough text from the word count? Maurelek: Well, not from the word count in the footer of the Editor. You can change the total word count shown in the Project Statistics because it’s based on Compile settings by default. I haven’t tested this on a PC, but here’s how if you’re using a Mac. 2. Hold down the Option key to change the Compile button to a Save button and click it (while still holding down the Option key). 3. In the Project Statistics window (Project–>Project Statistics), choose the Options button at the top. Make sure Count Current Compile Group Only is selected. When you click the Statistics button it should not count strikethrough text. HTH! Thank you Gwen, I did it on my Mac but it does not work. I think I’ll find a workaround with in-line annotations. This works in project statistics but not in the outliner word count. It is not a fundamental feature but it is a little bit annoying if you want to delete some text during a revision, but you do not want really to lose it, and at the same time check how the length of the revision is going. Thanks for help anyway.